Individuals love Braun because of their high-quality products. The Pulsonic Shaver is most men’s choice when it is about giving yourself the desired look with a well-built device. It is also considered the world’s no. 1 shaver brand. The 790-cc version comes with a cleaning and renewing station and is beautifully designed. It is metallic grey in color. It costs more than many other beard trimmers and shavers in the market. If you are buying a product of superior quality, it is worth the price. It can last for many years without any discontinuing or disturbance. You can have the best grooming experience. The 790 is better than other Braun series such as 390 cc or the 590 cc. Its renew and clean system is better than others. The foil shaver functions sideways when in contact with the skin which makes circular motions. It fits onto the hand easily. The handle is ergonomic and smooth. There are two solid parts of rubber that is black in color. It makes sure that you are holding onto the trimmer safely. You can use shaving lotions, creams, soap, gels or water to make the experience more soothing. That is why the rubber grips make sure that you are not dropping the device when your hands are slippery. The foil style shaver comes above the base and it permits the flexibility of the body. There is a blue button in the middle which also has a plus and minus sign. That lets you pick your shaving speed. There is something new about it and that is the cleaning indicator. It is colorful and it will tell you how power is left in the shaver. You will also know when it is time to clean it. Do not worry about using it in the shower or with wet hands. It is fully waterproof and you can wash it under running water. You do not want to get water inside the trimmer though because it will ruin the inner machinery. The company claims though that it is completely safe to use in the shower. There are three different settings so you can style your facial hair according to your wish. It is perfect for men with sensitive skin. 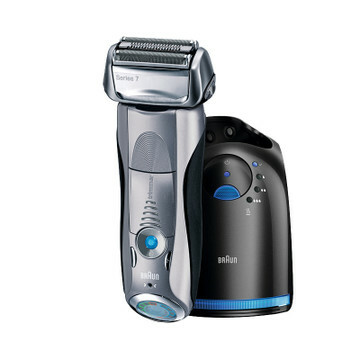 The Braun Optifoil makes sure that you get the closest shave possible. Two of them are used for the last finishing touches. It comes with a triple cutting system. There are three various elements to cut the long and short hairs. One advantage of using the Pulsonic from Braun is that it will clean and condition itself. You have to press a button and that will clean the shaver and lubricate itself for operation. The washing units are made from transparent plastic where the user can see the blue cleaning liquid inside. The units have an uncommon tooth-shaped design so they can effortlessly be put into the cleaning component. You will be able to get rid of the 99.99 percent of germs from the surface of the cutting blades on the beard trimmer of this Braun 790.